Nothing says “Spring Break” quite like a gathering of all your favorite people outdoors. A barbecue is an easy way to eat, drink, and enjoy one another’s company! Just be sure your backyard is ready by cleaning up your deck, patio, pathways, etc. We recommend establishing separate spaces where your guests can eat, play, or just relax. Be sure you have enough seating for everyone and don’t be afraid to ask your friends for help! Whether that’s bringing extra chairs, corn hole boards, or their favorite music. 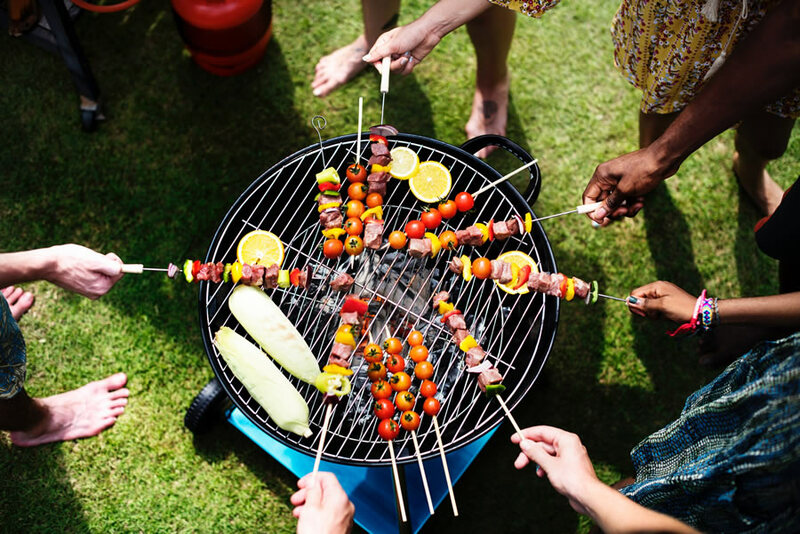 You can also turn your barbecue into a potluck of sorts, where you prepare the main protein(s), but your friends and family supply the side dishes and/or desserts. Prepare for unpredictable weather, too, by having tents on hand and a fire pit ready to go for those cooler spring nights. Now that high-quality projectors are so readily available, it’s easy to host your own movie night! If you don’t have a screen, you can always improvise using items you already have in your backyard. A light-colored shed or other outbuilding could make the perfect screen for whatever film you choose. Don’t underestimate a plain white sheet either, which can be draped or hung at the perfect vantage point—like your fence line. You can also go a little higher if you’re planning to sit and watch from your deck. Just be sure you pick a movie that everyone can enjoy or settle for a double feature this spring break. While this may not be the traditional spring break pastime, there’s nothing wrong with being productive this weekend! Honestly, we’re excited to take advantage of this time to cross a few items off our to-do list. Like cleaning and resealing the deck. Or giving our landscaping a little TLC, so it can thrive into late spring and summer. Now’s also a good time to start readying your pool! Although we have a few more weeks before Memorial Day, you can realistically open your pool any time you like. As long as you’ve inspected the lining and stocked up on the chemicals you need to clean it for a new season. Don’t forget to give yourself plenty of breaks and opportunities to enjoy the sunshine. It’s spring break, after all! However you decide to spend it, we hope you have a wonderful long weekend and a very happy Easter! Hopefully, we’ve convinced you that you can have fun in your own backyard. But if you need help sprucing things up before your next barbecue, give our fencing and decking team a call!